Since 1976, National Instruments has equipped engineers and scientists with tools that accelerate productivity, innovation, and discovery. NI's graphical system design approach provides an integrated software and hardware platform that simplifies development of any system that needs measurement and control. Engineers and scientists use this platform from design to production in multiple industries, advanced research, and academia. The company's long-term vision and focus on improving society through its technology has led to strong, consistent company growth and success of its customers, employees, suppliers, and shareholders. NI announced a new release of LabVIEW NXG, demonstrating continued investment in the next generation of LabVIEW engineering system design software. NI AWR software will be highlighted in special sessions at European Microwave Week (EuMW) 2018 in Madrid on September 25-27. The newly released NI AWR Design Environment V14 will be showcased within NI Booth #101 during European Microwave Week (EuMW) 2018, being held September 23-28 in Madrid. NI and Spirent Communications plc announced their collaboration to develop test systems for 5G New Radio (NR) devices. NI announced that it is coordinating with Skyworks Solutions Inc. to test products from their breakthrough Sky5™ unifying platform enabling revolutionary 5G applications. 3D Glass Solutions (3DGS) announces the release of an industry-first, glass-based RF integrated passive devices (IPD) process design kit (PDK) specifically for NI AWR Design Environment customers. AccelerComm has announced its 5G NR polar IP has been adopted by National Instruments. Wolfspeed, a Cree company, was challenged with designing a PA that could meet the demands of the EW market for high output power, high efficiency and large bandwidth for dismounted or man-portable applications that operate from battery power. A new application note and business impact case study detail how Quasonix used a novel design flow combining NI AWR software and highly accurate Modelithics models to achieve first-pass success. Cadence Design Systems Inc. and NI announced a broad-ranging collaboration to improve the overall semiconductor development and test process for next-generation wireless, automotive and mobile ICs and modules. NI has announced SystemLink, application software for distributed systems management. SystemLink helps improve operational efficiency and decrease maintenance costs through a centralized interface for automating tasks such as software deployment, remote device configuration and system health performance monitoring. NI AWR software will be on display at NIWeek 2018, taking place in Austin, Texas from May 21-24. NI announced that major automotive manufacturers like Subaru are using NI hardware-in-the-loop (HIL) technology to simulate actual road conditions for electric vehicle testing, eliminating environmental factors to reduce test time and costs. NI AWR Design Environment will be showcased in Booth #409 at the Electronic Design Innovation Conference (EDI CON) China 2018, taking place in Beijing from March 20-22. In addition, NI AWR software will be featured in two technical presentations on 5G and MIMO antennas, as well as a workshop on GaN PA design. Qorvo® and National Instruments (NI) have collaborated to test the first commercially available 5G RF front-end module (FEM). The testing demonstrations were held during the 20th GTI Workshop in London, U.K..
NI announced plans to collaborate with Samsung to develop 5G test UEs for 5G New Radio (NR). The first public demonstration of this collaboration will show Samsung’s 28 GHz base station communicating with an NI test UE at Mobile World Congress (MWC) 2018 in Barcelona next week. NI announced plans to collaborate with Shanghai University on a testbed focused on 5G ultra-reliable low-latency communications (URLLC) for vehicle-to-everything (V2X) applications. Takao Inoue and David Vye, AWR Group, NI, El Segundo, Calif.
NI AWR Design Environment will be on display in Booth #26-27 and #35-36 at COMCAS 2017, taking place in Tel Aviv, Israel from November 13-15, 2017. In order to better prepare engineering students to enter the workforce armed with cutting-edge RF/microwave design skills and also to spearhead advanced university research, NI AWR Design Environment has been donated to Saint Petersburg Electrotechnical University "LETI" (ETU). NI announced the release of NI Trend Watch 2018. The report examines the technological advances propelling our future faster than ever before along with some of the biggest challenges engineers face looking ahead to 2018. A variety of activities at European Microwave Week 2017 (EuMW 2017) will showcase NI AWR Design Environment for the design of power amplifiers (PAs), filters, radar systems and more. NI AWR Design Environment V13 will be featured in a variety of activities at EDI CON USA 2017, being held September 11-13 in Boston. Amarpal (Paul) Khanna, National Instruments, Santa Clara, Calif. The U.S. Commerce Department’s NIST awarded $2.3 million over three years to the NYU WIRELESS research center at the NYU Tandon School of Engineering, which will work with Italy’s University of Padova (UNIPD), the Austin Fire Department and NYU WIRELESS industrial affiliates to create a research platform for public safety communications. National Instruments, Santa Clara, Calif.
National Instruments (NI) announced pre-5G waveform generation and measurement technology at the 2017 International Microwave Symposium (IMS) in Honolulu. NI AWR software will be featured in several technical sessions during the 2017 International Microwave Symposium (IMS2017) being held in Honolulu from June 4-8. NI announced updates to the Wireless Test System (WTS), NI’s solution for multisite automated testing of wireless devices. The latest features in V13 of NI AWR Design Environment will be highlighted in multiple venues at the International Microwave Symposium (IMS) 2017 being held in Honolulu from June 4-8. NI AWR Design Environment will be featured at NIWeek 2017, taking place at the Austin Convention Center May 22-25. NI and NYU WIRELESS announced that NI has made a sizable donation to the university research team to further mmWave communications, channel measurement and channel emulation research for 5G communications and beyond. The quest for highly efficient 5G wireless connectivity has been given a boost thanks to a collaboration between a team of 5G engineers from the Universities of Bristol and Lund, National Instruments (NI), and BT Labs, one of the world’s leading providers of communications services. The research team has undertaken field trials of a massive MIMO system at the BT Labs in Adastral Park, Suffolk. The trials were conducted in a large indoor hall mimicking a stadium environment and outdoors within the Adastral Park campus. NI announced the availability of the USRP-2945 quad receiver software defined radio (SDR) and the USRP-2944 high performance 2x2 multiple input, multiple output (MIMO) SDR. Both models deliver a new level of performance and capability to the USRP (Universal Software Radio Peripheral) family. Version 13, the first major update in 2017 to NI AWR Design Environment, has been released. V13 provides key new capabilities and major enhancements to better address the design challenges associated with highly-integrated RF/microwave components commonly found in communications, phased-array radar and other electronic systems. NI, the provider of solutions that enable engineers and scientists to solve the world’s greatest engineering challenges, announced the opening of the new NI Industrial IoT Lab at its Austin,Texas headquarters. In this special edition of the Automated Test Outlook 2017, NI co-founder and chairman of the board Dr. James Truchard reflects on the past 40 years of test and measurement, identifies the most significant market and technology trends from recent years and looks forward to what lies ahead. 5G Opens Up mmWave Spectrum: Which Frequencies Will Be Adopted? NI AWR Design Environment will be showcased at multiple events during European Microwave Week 2016 (EuMW 2016), from October 4-6 in London. NI AWR software demonstrations on display in Booth #4 include the latest applications featuring load pull, radar systems, antenna design, AWR Connected™ third-party integration flows and the newest product in the NI AWR design software portfolio, AntSyn™ , a cloud-based software as a service (SaaS) for antenna synthesis and optimization solution. Booth visitors will also be treated to a special sneak peek of select new features in the upcoming V13 release. NI, the provider of platform-based systems that enable engineers and scientists to solve the world's greatest engineering challenges, announced that its board of directors has elected Alex Davern, to serve as chief executive officer and president of National Instruments, effective January 1, 2017. Davern will succeed Dr. James Truchard, who has served as the chief executive officer of NI since the company's founding in 1976. Dr. Truchard will remain as chairman of the board. NI, the provider of platform-based systems that enable engineers and scientists to solve the world’s greatest engineering challenges, announced the world’s first MIMO Application Framework. When paired with NI software defined radio hardware, this software reference design provides a well-documented, reconfigurable, parameterized physical layer written and delivered in LabVIEW source code that enables researchers to build both traditional MIMO and Massive MIMO prototypes. NI announced a second-generation vector signal transceiver (VST).The NI PXIe-5840 module is the world’s first 1 GHz bandwidth VST and is designed to solve the most challenging RF design and test applications. NI announced the NI PXIe-4135 source measure unit (SMU) with a measurement sensitivity of 10 fA and voltage output up to 200 V. Engineers can use the NI PXIe-4135 SMU to measure low-current signals and take advantage of the high channel density, fast test throughput and flexibility of NI PXI SMUs for applications such as wafer-level parametric test, materials research and characterization of low-current sensors and ICs. AWR Connected™ for ANSYS now offers an integrated two-way link between ANSYS® HFSS™ and NI AWR Design Environment™, specifically Microwave Office circuit design software, enabling RF/microwave designers to seamlessly tie HFSS extracted S-parameters back into NI AWR software. This integration unites two industry-standard design tools, HFSS full-wave electromagnetic (EM) field simulation and Microwave Office, to quickly and accurately simulate microwave circuits. NI, a provider of platform-based systems that enable engineers and scientists to solve the world’s greatest engineering challenges, announced the NI PXIe-4081 7½-digit high-performance DMM and 1.8 MS/s isolated digitizer. The NI PXIe-4081 is the first PXI Express DMM available. It offers engineers the flexibility, resolution and isolation needed to tackle challenging applications that require smarter test systems in industries ranging from consumer electronics to aerospace and defense. NI AWR Design Environment™ will be showcased in a slate of activities at the International Microwave Symposium (IMS) 2016, taking place in San Francisco May 22-27. A number of NI AWR software demonstrations on load-pull and radar systems, as well as antenna design and third-party integration flows will be on display in Booth #1529. Also being showcased is AntSyn™, a new, cloud-based software as a service (SaaS) antenna synthesis and optimization solution that enables designers to input their antenna engineering requirements and produce antenna designs as outputs. NI announced the release of its Automated Test Outlook 2016. The annual test and measurement report delivers a comprehensive view of the key trends expected to impact automated test environments with the proliferation of connected devices, from preparing to test mmWave communication to effectively using manufacturing test data to propel business results. The NYU WIRELESS research center announced it will build an advanced programmable platform to rapidly design, prototype, and validate technologies vital for the millimeter wave (mmWave) radio spectrum, which is potentially key to launching the next ultra-high-data-rate generation of wireless communication, or 5G. NI (formerly AWR Corp.) announces the agenda has been set and registration opened for its annual combined AWR Design Forum (ADF) 2015 / German User Group meeting being held November 26, 2015 at the NI European Headquarters in Munich. National Instruments, a leading provider of platform-based test systems that enable engineers and scientists to solve the world's greatest engineering challenges, announced its acquisition of Micropross, a company based near Lille, France, a technology innovator and leading supplier of test systems for Near Field Communications (NFC), smart cards and wireless charging test systems. Micropross will continue to operate as a wholly owned NI subsidiary under the leadership of the existing management team. NI (formerly AWR Corp.) announced that NI AWR Design Environment™ V12 will be featured in a host of activities at European Microwave Week 2015 (EuMW2015), being held September 8 to 10 in Paris. NI (formerly AWR Corporation) announces that NI AWR Design Environment™ will be on display within the Academic Forum, 5G/RF Pavilion and two technical sessions - High-Efficiency PAs for High PAR Signals Using an NI-Based Platform and Improving the Semiconductor Design-to-Test Flow Panel - during NIWeek 2015, August 3-5 in Austin, Texas. NI (formerly AWR Corp.) released its version 12 Analyst-MP™ 3D multiphysics finite element method (FEM) electromagnetic (EM) analysis software. This latest version delivers up to 10X improvement in speed from the previous version, making it even faster for analyzing extremely complex high-frequency, multiphysics structures. NI (formerly AWR Corp.) announces that Nanjing University of Science and Technology (NUST) electronic engineering students have designed a miniaturized bandpass filter (BPF) using NI AWR Design Environment™ software. NI (formerly AWR Corp.) announces AWR Connected™ for DWT, a new NI AWR Design Environment™ flow that enables integration with Design Workshop Technologies’ (DWT) design-rule checking (DRC) and/or layout vs. schematic (LVS) tools for printed circuit board (PCB) and module design. The new AWR Connected for DWT DRC and LVS flow can run in one of two ways: in the full view/DWT user-interface (UI) mode or transparently from within the Microwave Office UI. NI (formerly AWR Corp.) announces that AWR Connected™ for AMCAD will be on display at the International Microwave Symposium 2015 (IMS 2015), May 18 to 22, in Phoenix in NI Booth #2431. AWR Connected for AMCAD provides ready access between NI AWR Design Environment™ V12 software and AMCAD Engineering stability analysis (STAN) software. A.P.S. Khanna, NI Microwave Components, Santa Clara, Calif.
NI (formerly AWR Corp.), announces that NI AWR Design Environment™ V12—the first major software release in 2015—is now available as a pre-release to select customers, partners and evaluators. Previewing for the first time at International Microwave Symposium 2015 (IMS2015) at NI Booth #2431, this latest release boasts new load-pull and antenna- and radar-specific features, as well as ease-of-use improvements, speed enhancements and third-party integration flows. National Instruments, Microwave Components Group, Santa Clara, Calif.
NI Microwave Component's popular QuickSyn Lite frequency synthesizers are now extended to millimeter wave. The new synthesizer modules employ the same revolutionary phase-refining technology that all QuickSyn products use to enable fast switching speed, low phase noise, compact size, and low cost. The modules are available in three popular bands—27 to 40 GHz, 50 to 67 GHz, and 76 to 82 GHz—and are designed to supply medium power output. These new products present a very cost-effective solution for applications requiring a stable and clean CW millimeter-wave source. NI, the provider of solutions that enable engineers and scientists to solve the world’s greatest engineering challenges, announced the opening of the new Wireless Innovation Lab at its Austin, Texas headquarters. MACOM designers used NI AWR Design Environment™ software inclusive of Microwave Office circuit design software, AXIEM 3D planar EM simulator, Analyst™ 3D FEM simulator, and APLAC harmonic balance (HB) simulator to successfully design and simulate a 4 W Ka-band PA using a 2 mil thick 0.15 um GaAs pseudomorphic high-electron mobility transistor (pHEMT) process. National Instruments (NI) announced Q1 revenue of $289 million, up 2 percent year over year (YOY) in U.S. dollar terms and up 8 percent YOY in constant currency terms. NI (formerly AWR Corp.), will showcase NI AWR software throughout the International Microwave Symposium 2015 (IMS2015) in a number of ways. A preview of V12 NI AWR Design Environment™ software, including new load-pull and antenna features, as well as ease of use, speed enhancements and third-party integration flows, will be on display inside NI booth #2431. IMS2015 runs from May 17-22 in Phoenix. NI (formerly AWR Corp.) will be showcasing NI AWR Design Environment™ software at Booth #315 at the Electronic Design Innovation Conference 2015 (EDI CON), being held April 14-16 in Beijing, China. NI (formerly AWR Corp.) announces that Thales Alenia Space (TAS) Italy has successfully developed a complete RF/microwave flow using NI AWR Design Environment™, dramatically cutting design-to-production times and increasing design reuse. NI (formerly AWR Corp.) announces that a student at Middle East Technical University (METU), located in Turkey, used NI AWR software to successfully design a true-time-delay phase shifter with center frequency at 35 GHz by means of microelectromechanical systems (MEMS) technology. National Instruments (NI) announced Q4 revenue of $333 million, up 11 percent year-over-year. The company's total orders were up 13 percent for the quarter with orders under $20,000 up 5 percent year-over-year; orders between $20,000 and $100,000 up 13 percent year-over-year; and orders above $100,000 up 36 percent year-over-year. In Q4 2014, NI recognized $7 million in revenue from its largest customer, compared with $4 million recognized in Q4 2013. NI (formerly AWR Corporation) has added Korea (September 30) to its list of venues in Asia Pacific as well as finalized the agenda and opened registration for itsJapan venue. Visit National Instruments at booth 633 at IMS2014. National Instruments, a leader in test and measurement, data acquisition and computer automation, is collaborating with several top researchers focused on RF and wireless communications research—specifically fifth generation (5G) wireless communications. The proliferation of smart devices has led to a wireless spectrum shortage, which means researchers are seeking new ways to alleviate the bandwidth crunch and increase network data capacity. Market analysts predict that spectrum demand in the U.S. will outstrip capacity by 2017. Experts from National Instruments, Agilent Technologies and Aeroflex weigh in on the future of RF/microwave test and measurement instrumentation. National Instruments announced the NI PXIe-5162 digitizer and updates to the LabVIEW Jitter Analysis Toolkit. The digitizer provides high-speed measurements at four times the vertical resolution of a traditional 8-bit oscilloscope. National Instruments announced its acquisition of Dresden, Germany-based Signalion GmbH. The acquisition delivers strong wireless communications talent and technologies to the NI platform, which are critical to NI’s goal to continue to drive long term growth in the communications test industry. 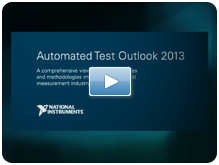 National Instruments released its Automated Test Outlook 2013 highlighting the company’s research into the latest test and measurement technologies and methodologies. The report examines trends affecting a variety of industries. The MILCOM management and sponsors made a wise decision to cancel the event this year as most of the east coast was pretty much closed down from hurricane Sandy. Everyone I know in New England down to the Mid-Atlantic found out over the weekend that their flights were cancelled. It was a good move and addressed any safety concerns of people trying to get there. MILCOM even analyzed their attendee list and determined that approximately 40% of them would be affected by the storm so decided to cancel. I applaud them for taking this action and promoting it quickly to the attendees. Even though the show was cancelled, there was still a lot of company news and products that I received for the event so here is a summary of the show that did not happen from an RF/microwave perspective. EDI CON 2013 (March 12-14, Beijing, China), the industry-driven event for RF, microwave and high speed digital electronic design announces the recent addition of several leading RFIC, component and material manufacturers, semiconductor foundries, EDA software and test equipment/solution providers as participants in the technical program and exhibition. As solution providers in high frequency electronic design and system integration, experts from these companies will offer attendees the latest information on the technology used in today’s communications and aerospace industries. A release of AntSyn™ antenna design, synthesis and optimization software is now available for use by current customers and evaluators. Applications include 5G, IoT, arbitrary-area antennas and arrays. "Conquer Radio Frequency—A Multimedia Conceptual Guide to RF & Microwave Engineering" featuring the use of NI AWR Design Environment, specifically Microwave Office circuit design software, is now available online for free thanks to sponsorship by National Instruments. NI announced the WLAN Test Toolkit 17.0 with support for Draft 1.1 of the IEEE 802.11ax standard. Combined with NI’s second-generation Vector Signal Transceiver (VST), the WLAN Test Toolkit 17.0 supports 802.11ax waveform generation and analysis for characterization, validation and production test of products, such as RF front end components, wireless modules and user devices, that implement Draft 1.1 of the IEEE 802.11ax standard. NI AWR Design Environment Version 13 now offers an improved flow between AWR Connected™ for Sonnet® and Sonnet Suites Version 16.54 using the latest EM Socket II architecture, which streamlines design flows between NI AWR software and third-party electromagnetic (EM) tools. The new partner flow boasts 64-bit compatibility, as well as asynchronous EM simulations. NI and Astronics Test Systems Inc. announced the Astronics PXIe-6943 Digital Test Instrument, Astronics PXIe-3352 Rubidium Clock Source and Astronics PXIe-1209 Pulse Pattern Generator. The three test instruments accompany the previously released Astronics PXIe-2461 Frequency Time Interval Counter and are the latest products from NI and Astronics’ collaboration to provide PXI-based instruments with test program set-(TPS-) compatible software for existing VXI instruments. NI announced the NI PXIe-4081 7½-digit high-performance DMM and 1.8 MS/s isolated digitizer. The NI PXIe-4081 is the first PXI Express DMM available. It offers engineers the flexibility, resolution and isolation needed to tackle challenging applications that require smarter test systems. The NI PXIe-4081 is the industry’s most accurate 7½-digit DMM, with an industry-leading 15 ppm accuracy for DC V measurements up to two years after calibration. The NI PXIe-5668R vector signal analyzer (VSA) offers 765 MHz of bandwidth with best-in-class measurement performance and speed. This high-performance microwave signal analyzer meets the challenging requirements of applications such as wireless communications, radio frequency integrated circuit characterization, RADAR test, and spectrum monitoring and signal intelligence. Gain the flexibility you need to build a measurement system that meets your application-specific requirements. The CompactDAQ controllers integrate a processor and removable SD storage with high-quality signal conditioned measurements and digital, counter, and communication bus I/O in a small, rugged enclosure. You can reduce system cost and complexity while increasing accuracy. The NI USRP™ RIO software-defined radio (SDR) platform provides the optimum balance between price, performance and form factor. Built on the NI LabVIEW reconfigurable I/O (RIO) architecture, NI USRP RIO delivers an integrated hardware and software solution for rapidly prototyping high-performance and high-channel-count wireless communication systems. Visual System Simulator™ (VSS) is a complete software suite for today’s complex communication systems that enables engineers to design the right system architecture and formulate suitable specifications for each of the underlying components. VSS is built upon Unified Data Model™ architecture (as is Microwave Office®) and therefore provides for seamless system and circuit level co-simulation. The NI PXIe-7975R FPGA module features a digital signal processing (DSP)-focused Xilinx Kintex-7 FPGA and 2 GB/s of onboard DDR3 DRAM. This FPGA incorporates 1,540 DSP slices, which you can use to implement digital filters, custom signal processing, and Fast Fourier Transform (FFT) logic, all of which are commonly found on analog FPGA-based instruments. The NI PXIe-5186 digitizer, co-developed by National Instruments and Tektronix, delivers a new level of performance in the small-form-factor, low-power PXI platform. Tektronix technology provides the trusted measurement fidelity of Tektronix oscilloscopes. The digital back end uses NI synchronization and memory core (SMC) technology to deliver high-data throughput at rates greater than 700 MB/s. This application note demonstrates a simulation-based methodology for broadband power amplifier (PA) design using load-line, load-pull, and real-frequency synthesis techniques. The design highlighted in this application note is a Class F amplifier created using the Qorvo 30 W gallium nitride (GaN) high electron mobility transistor (HEMT) T2G6003028-FL. RF transmitters are an essential part of modern communications. Designed and assembled from core RF components, RF transmitters have many different forms and applications. We often think of RF transmitters in wireless communications, but the concept applies equally to wired applications such as cable television. National Instruments is leading the way in providing more open and flexible measurement devices based on field-programmable gate array (FPGA) technology. Learn how you can use NI LabVIEW FPGA to design and customize your RF instrumentation, and discover the advantages software-designed instrumentation can provide in your test systems. Request your free copy of the NI RF and microwave poster, a comprehensive reference chart of the latest wireless standards, conversion tables, and formulas. Order to receive your full color poster by mail. The modern breed of test engineers is already using intuitive new technologies to reduce space and decrease test and development time all in a reduced budget. National Instruments is helping test engineers address these challenges with user-programmable FPGA-based instrumentation. Learn more about the benefits of using an open field-programmable gate array (FPGA) for 802.11ac testing specifically. What Is a Vector Signal Transceiver (VST)? Software-defined RF test system architectures have become increasingly popular over the past several decades. Almost every commercial off-the-shelf (COTS) automated RF test system today uses application software to communicate through a bus interface to the instrument. As RF applications become more complex, engineers are continuously challenged with the dilemma of increasing functionality without increasing test times, and ultimately test cost. While improvements in test measurement algorithms, bus speeds, and CPU speeds have reduced test times, further improvements are necessary to address the continued increase in the complexity of RF test applications. National Instruments has redefined the traditional approach by combining PXI hardware and NI LabVIEW system design software, leveraging commercial technologies such as multicore microprocessors, user-programmable FPGAs, PCI Express hardware, and system design software to meet the flexibility and scalability demand for future high-frequency test and measurement applications. This paper discusses the setup details for the demo shown in this video Head to Head: NI 5665 vs. Traditional Boxed Instruments. The demo compares the performance and speed of the NI PXIe-5665 with the Agilent PXA. Rather than comparing the datasheet specifications of both instruments, this video compares the two instruments while performing real- world test scenarios. Signals intelligence describes a broad range of applications ranging from communications jamming to identification of interference or pirating signals. While this paper discusses many of the specific needs for each application, it primarily focuses on the techniques required to analyze intermittent or "bursty" RF signals.